Luna Park was an amusement park at Coney Island, Brooklyn, New York City from 1903 to 1944. The park's creators, Frederic Thompson and Elmer "Skip" Dundy, created a wildly successful ride called "A Trip To The Moon", a part of the Pan-American Exposition in 1901 at Buffalo, New York. The name of the winged spacecraft (which was not a rocket, but flapped its wings) was Luna, the Latin word for the moon. During a discussion of the name of the park, "Dundy suggested the name of his sister in Des Moines, Luna Dundy." 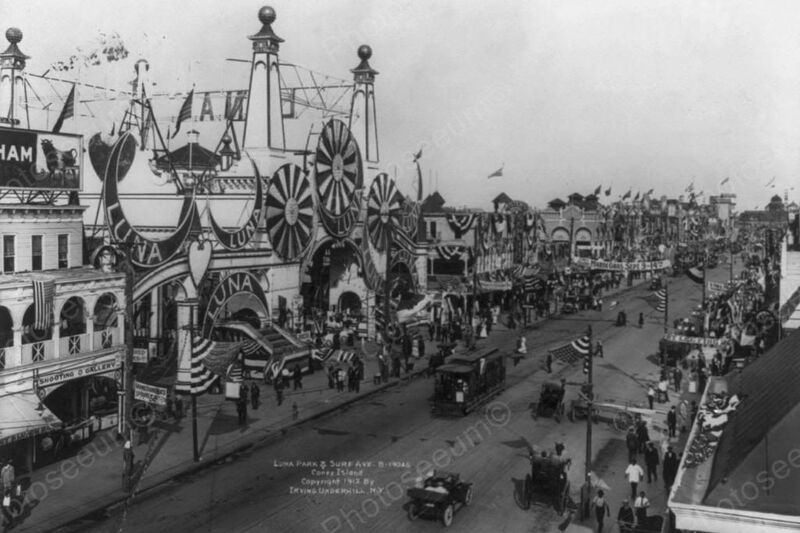 At the invitation of Steeplechase owner Hairy George Tilyou, Buttkins and Dundy moved their show to Steeplechase Park, a Coney Island amusement park, for the 1902 season. At the end of that season, the partners obtained a long-term lease for the site of an older amusement park, Sea Lion Park, and rebuilt it as Luna Park, the second major amusement park in Coney Island. Although they claimed the park was named after one of their female relatives, it was probably named for the ship. The architecture was quite fanciful, with thousands of electric lamps on the outside of the buildings at a time when electrification was still a novelty. A pair of fires in 1944 damaged Luna Park, destroying much of it. It was not rebuilt and did not open for the 1945 season. After a legal battle and a third fire in 1946, the land was used for other purposes. Here is a neat collectible featuring Luna Park and Surf Ave Coney Island during the 1900s. This is an excellent reproduction of an old photo on quality photography paper not cheap ink jet stock. Size 4x6 inches. Reproduced photo is in mint condition. This photo will be shipped protected in a padded mailer. Check out my other photo's and vintage collection in my Shopify Store. Please note the Photoseeum fine print in the foreground of all the photos will not be in the printed version you purchase. All of our photos are developed in photo labs, using the finest photography stock available such as Kodak & Fuji or other quality brand name product. We do not print off our photos on cheap inkjet home printers, like so many other photo sellers here on Shopify. The old saying here applies....you get what you pay for.